Madden NFL ’13 is an upcoming American football video game based on the National Football League, published by EA Sports and developed by EA Tiburon.EA’s Chief Creative Officer Richard Hilleman said that defense will receive various changes in mechanics and controls, being one of the first known new changes in the game. The cover features Calvin Johnson of the Detroit Lions. The game will be released on August 28, 2012. This year, CBS’ number-one commentary crew of Jim Nantz and Phil Simms will anchor the game in the broadcast booth. Nantz and Simms appear in an in-booth cutscene before the game that includes stadium-specific backgrounds. EA is introducing 200+ new cutscenes between plays, before games, and more. These cutscenes are inspired by broadcast TV presentation. Replays are also being overhauled for more dramatic effect. Halftime features a new stats overlay, but there is no halftime show. The game contains all the new Nike uniforms and alternates on the disc. Some of the uniforms may have to be unlocked via a code as they are released in real life. Lighting changes based on the time of day occur per play instead of just at quarter breaks. 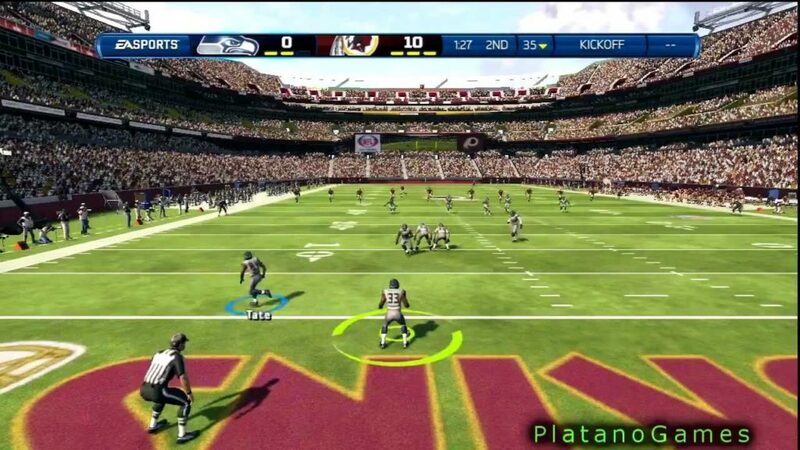 Madden NFL 13 features improved high dynamic range lighting and motion blur. Place the ball on a receiver’s back shoulder, out toward the sideline, up high, down low, and other places where only your receiver can get it. Madden 13 integrates new pass trajectories and ball speeds to open up more areas of the field in the passing game. New pass animations speed up the time in which quarterbacks get rid of the ball, including a new shovel pass and specific set-ups for throws on the run. To improve the receiving, EA is including more than 430 new catch animations, some of which are fueled in part by the changes made to the left-analog passing stick. EA Tiburon says it also wants to make user catches easier to do by slowing down players when they select a receiver. The quarterbacks have new moves for avoiding the pass rush. A slowed down pocket speed give you more control when you’re trying to not get sacked. EA tweaked play-action to include an abort command that cancels the animation for those situations where a defender is barreling in unabated. Running backs should be better in blocking after the fake (as well as release for passes) and defenders will be faked out more by play-action. Receivers have timing windows in their routes. When they expect the ball they’ll turn their head to the quarterback. Passing to a receiver who isn’t expecting the ball will often result in an incompletion. However, receivers will sometimes look for the ball earlier if the cornerback across the line of scrimmage blitzes or the receiver beats the jam at the line. Neither receivers nor defensive backs react to a ball unless they are expecting it (like in the case of a quick slant for receivers) or they have their heads turned and are looking at it. Defenses line-up opposite receivers in a best-on-best designation. This prevents your linebacker from matching up against an elite wide receiver lined up in the slot, for instance. Defenses disguise their man or zone coverage before the snap so offenses can’t try to use motion to uncover the defense’s plans. Defenders use different coverage techniques such as off coverage (where they start seven or so yards off the line of scrimmage and attempt to read the ball), trail techniques (including hand fighting), and split techniques (where the linebacker stands between the tight end and slot receiver). New animations allow for simultaneous tackles while the ball is being caught (including being able to knock out the ball in mid-air), and in general the development team says it’s been working on the interplay between players while the ball is in the air. EA promises enhanced AI playcalling for two-minute drill, goal line, clock draining, and red zone situations. New Infinity Engine improves tackle animations and the outcome of player interactions including a balance system. Over 82 hours of commentary, to keep the audio new and different each time, with over 9,000 unique lines. Most of the lines are ad-libbed and Nantz and Simms regularly have interactions and comment on what is actually happening on the field. In addition, an approx. 15-16 track, fully orchestrated soundtrack, also composed by O’Malley, will replace EA Trax for the music on the menu screens and other game modes. Partnership with NFL Films to get exclusive sound clips, such as QB cadences, hits/tackles, and group chatter, only available in Madden NFL 13. New crowd noise, recorded with 24 microphones, opposed to 4 microphones in previous years. Kinect is included on the Xbox 360 console. “Tebowing” will be included in the game. Connected Careers: Combines Franchise, Online Franchise, and Superstar modes as well as historic players into one gameplay option. It will also make it no longer possible to import draft classes from NCAA Football. Love the commentary…the entire length of the field he says "breaks free" …that's it. Anyone remember the name of the song that plays when you score a touchdown?